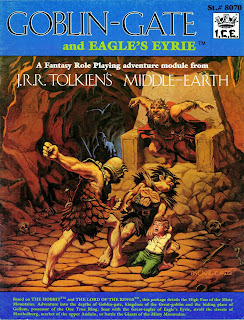 The best old-school D&D modules managed to pack a lot in short space, and Goblin-Gate reminds me of that effortless economy. 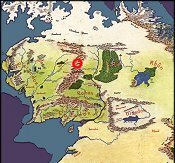 First, there's the mountain city of the orcs, spanning close to forty miles; second the Northmen town of Maethelburg east of the mountain range; third the sky citadel of the eagles; and last a giant's isle in a massive lake to the north of the High Pass. All of this in a 40-page module declares its business with little fanfare, and confirms my general confidence in the adventure-sized approach. The eagles' lair doesn't have much to it, and is described in a single paragraph (which I'll remedy below), but aside from this point, the module delivers pretty much as it should. Goblin-Gate is essentially Mount Gundabad in miniature, with a quarter of the population (around 3000 orcs) but the same infra-structure. The Great Goblin is as nasty as the northern Ashdurbuk, has a pair of warlords on hand just as treacherous and a priest whose sacrificial knife is just as busy. The warlords command gates instead of spires: the Wolf Gate, the Back Door, and (after the dwarf war of 2793-99) the concealed Front Porch that would ensnare Bilbo and the dwarves. Goblin-town itself is classic D&D nastiness, a network of caverns and twisting passages ending in wild feasting halls, torture chambers, and (again like Gundabad) a gladitorial arena where slaves and captives battle hideous creatures for their lives. The layout of the mountain is excellent, with route maps of Goblin-town's three levels, the ice caves above, the fungi caves below. Goblin-town is then fleshed out with standard dungeon layouts for all levels, as well as the entrance areas of the three gates. The wild card of Goblin-Gate is of course Gollum (during the 2470-2944 period), an invisible predator who hates orcs as much as the Free Peoples, and he can be put to extraordinarily good use. His wretched rock-island evokes pity in a way that always catches me off guard. Here's the bearer of the mightiest artifact of the Third Age, living in the foulest habitat, hate-filled yet craving the company of his kind: "Lone intruders are 90% likely to be ambushed by surprise, but there is only a 20% that Gollum will attack a hobbit outright." The wheels are spinning to any Tolkien fan. To run Goblin-Gate without at least one hobbit PC is a wasted opportunity; DMs can get plenty of mileage replicating the bickering and backbiting dynamics out of The Two Towers, let alone The Hobbit. After terrors below the mountains comes a ray of hope from above, at Eagles' Eyrie, the impregnable sky-citadel of Manwe's servants. The eagles are fascinating but an ongoing bone of contention. Some complain that Tolkien used them inconsistently to get out of jail free, while apologists rationalize their every move. And of course there's the classic "plot-hole" of them flying Frodo and Sam away from Mount Doom, underscoring how easy it would have been to fly them to the cracks to begin with. It's not a plot-hole at all actually, though the issue isn't as tidy as the apologists think. My view of the matter is this: The free peoples have to fight their own battles as responsible beings, and the eagles, as servants of the gods, can't (or won't) do their heavy-lifting for them anymore than the Valar can (or will). Yet they are permitted (or willing) to intervene in rare cases, mostly for rescue operations -- like Maedhros from Thangorodrim; Hurin and Huor from Dimbar; Bilbo and the dwarves from Goblin-Gate; Gandalf (twice) from Orthanc and the peak of Zirakzigil; Frodo and Sam from Mount Doom. They can also lend help in battle when the stakes are highest -- as they did in the War of the Wrath (which even the Valar joined), and when the Black Gate opened (which by rights spelled the end of the world). So far so good. But that doesn't account for the Battle of Five Armies, which was a pinprick on the map of Endor's conflicts, and which I don't think the eagles had any business getting involved in. I think it safe to say that at the time of writing The Hobbit Tolkien's intuitions on the nature of the eagles were crude at best. Take my philosophical detour for what it's worth. I advise simply treating the eagles as "of the gods" in game play, and remember too that they're not always kind; they feast on the livestock of poor decent people. Goblin-Gate is a solid installment, and shows that without Gandalf, Bilbo and the dwarves wouldn't have stood a chance in escaping Goblin-town. Word to the wise.